In mid 2018 I had the pleasure of attending a JFSP sponsored workshop that brought together half ecologists, half social scientists to talk about what resilience to fire really means in a truly linked perspective. It was fascinating. I believe we spent a full day arguing before we realized our basic definitions of what resilience actually means (bouncing back to the same state? adapting to new realities?)! It was highly instructive, and out of it came a really valuable way to think about resilience, adaptability, and dealing with (or avoiding change). I think it does an excellent job of bringing choice into our discussions of dealing with climate change, and brings a sense of agency back to ecological management discussions. Higuera P, Metcalf A, Miller C, Buma B, McWethy D, Metcalf E, Ratajczak Z, Nelson C, Chaffin B, Stedman R, McCaffrey S, Schoennagel T, Harvey B, Hood S, Schultz C, Black A, Campbell D, Haggerty J, Keane R, Krawchuk M, Kulig J, Rafferty R, Virapongse A. 2019. Integrating subjective and objective dimensions of resilience in fire-prone landscapes. BioScience. In press. Having just been in southern Chile for so long, I was struck how similar southern and southwestern Tierra del Fuego and the archipelagos are to southeast Alaska. Peat bogs (turbols), low treeline, and low evapotranspiration dominate, as does a general lack of fire (wind and landslides rule here). Recently, a group of colleagues and I published a paper comparing the emerging changes in both regions, comparing and contrasting fire and snow dynamics in both areas as potential future stressors for forests. There’s a lot that can be learned from each area - snow loss up in the north, the emergence of fire in the south. Both areas are moving in the same direction, but in different ways, so a comparative approach is extremely valuable. Buma B, Battelori E, Bisbing S, Holz A, Hennon PE, Mortiz M, Saunders SE, Creutzburg MK, DellaSala DA, Gregovich D, Krapek J, Zaret K, Bidlack A. Emerging freeze and fire dynamics in temperate rainforests. Austral Ecology. In press. A new paper describing the carbon status of the North Pacific temperate rainforests of southeast Alaska was just accepted for publication by PLOS ONE, and will be out soon. It’s the first study to every document and map the biomass C of the densest forest in the United States, the Tongass rainforest and surrounds. 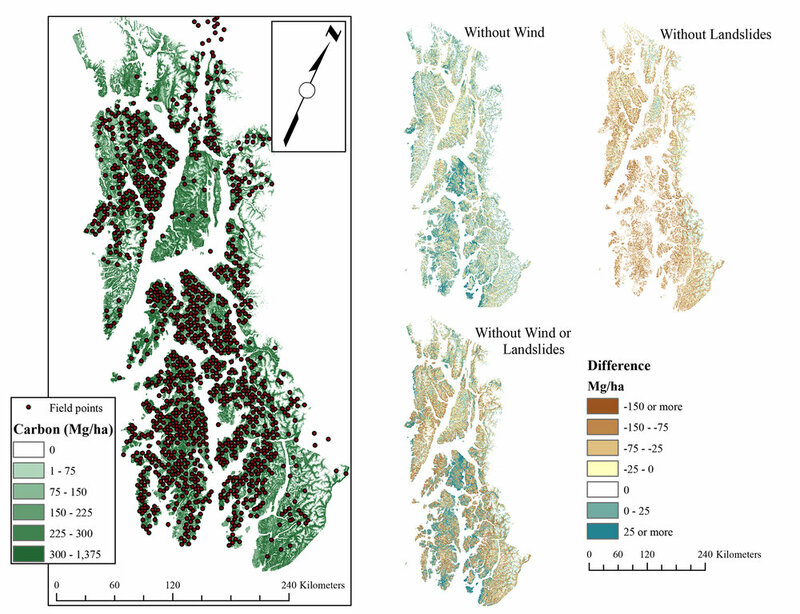 In this paper we used USFS data and machine learning, coupled with disturbance modeling, to build a climate, topography, and disturbance sensitive model. We then used the validated model to test if disturbances were driving down forest carbon across the region or if they were actually increasing baseline carbon (they are pretty rare). We found higher carbon in areas of higher disturbance exposure, to a point, indicating that infrequent disturbances do likely result in more productive landscapes compared to areas where disturbances are non-existent. Buma B, Thompson T. Long-term exposure to more frequent disturbances increases baseline carbon in some ecosystems: Mapping and quantifying the disturbance frequency-ecosystem C relationship. PLOS One. In press. Figure 2 from the publication - the map, validation points, and what happens to predicted carbon stocks in the model if disturbances are set up their lowest setting. Sorry for no updates for a while - several new publications will come in a flurry of a few posts as I get time (really good month for that!). But, the lack of posts is due to the long, long time spent in southern Chile with National Geographic. 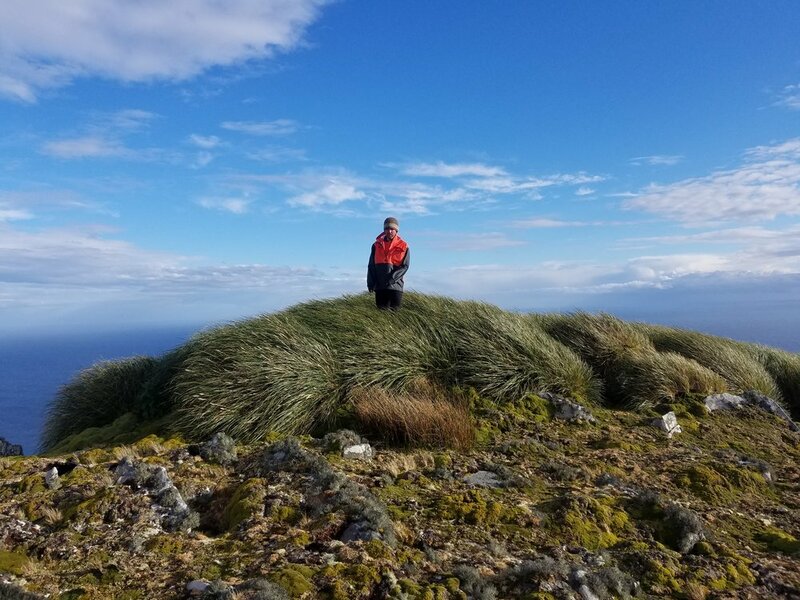 The trip to Cape Horn, to study forests and ecosystems at the end of the world, was amazing. Beautiful, windswept, austere, wind scoured, green and almost tropical, and wind blasted. It’s a windy place. Wind seems to shape everything we saw, from the distribution of cushion plants to tree structure to animal life. Storms blow in and out in 15 minutes - including snow, sun, rain, sleet, and mist. It’s a wild place. 5m seas in a small boat, grumpy penguins (I got bit by one! ), and difficult walking made movement exhausting - sometimes an hour to go a 1/4 mile. But we got it done - several new research plots, temperature loggers installed, stress measured, and more. Looking forward to a successful series of studies at the edge of the world! Andres Holz (PSU) is collaborating, and endured all of this as well! Also, thanks to Craig Welch, Ian Teh, John Harley, Enzo Fermani, Ricardo Rozzi, Ivan Diaz, and many more for their work. One of the most fun groups I’ve worked with over the past several years is the NSF RCN Novus network (https://novusrcn.wordpress.com/), a group that has tried to get together “neo” disturbance ecologists - those of us working in the short term, doing fieldwork in disturbed areas, all that - with paleo ecologists. It’s been fun trying to reconcile perspectives and come up with ways to ask interesting questions across timescales. A new perspectives paper was just accepted in Landscape Ecology where we look at mixing the mechanistic understandings of neo ecology with the deeper time perspective of paleo, and suggest ways to strategically link the two. I think it’s interesting because it’s not talking about individuals - it’s suggesting ways to collaborate strategically and create study designs collaboratively. Not a “tack the paleo on” for a new perspective, but rather to deeply integrate it into the conceptual/proposal stage. Buma B, Harvey B, Gavin D, Kelly R, Loboda T, McNeil B, Marlon J, Meddens AJH, Morris JL, Raffa K, Shuman B, Smithwick E, McLauchlan K. The value of linking short and long-term perspectives to understand spatially-explicit ecosystem resilience. Landscape Ecology. In press. A couple great sketched maps of Isla Hornos, from the old to the new to the newest. Getting closer! One of the first maps to show Tierra del Fuego as its region, separate from the mainland. This was after the Horn (really, the Hoorn due to the Dutchmen that named it) was doubled for the first time, but prior to several other exploratory firsts including the Falklands being completely described. And the most modern view, courtesy of NASA. Gavin McNicol, a postdoc in the lab (now at Stanford), has just published his work on coastal forest carbon. Coastal rainforests are the most biomass-carbon dense forest biome in the world, and Gavin focused on building a high spatial resolution/broad extent map of the soil/non-biomass portion of that - which is actually abut 60% of the total. He did a great job, working at 90m resolution across 10 degrees of latitude, a truly difficult task. In total, we’re looking at approximately 4.5 Pg C in the top 1m, mostly driven by precipitation and topography. One of the most interesting aspects of the project was Gavin’s comparison to global maps, which are used in global C budgets and models. Our work here is highly detailed, and works with an extensive soil observation network that was put together specifically for this task. So it’s useful to compare and validate global maps, since the scales are at least comparable (e.g., we’re not comparing one observation to a global map, but a huge region/part of the globe). The global maps are generally pretty poor - 4 fold lower than SoilGrids250m, the finest resolution global map available and significantly more accurate against observations. That was true for other global maps as well. This type of modeling, at this scale, is quite useful for evaluating global products that are so important for our global change research - they are produced at the right scale for comparison and thus far better for validation than just a series of points that may skew accuracy spatially. I think it’s fairly clear we need more of these types of studies and evaluations. McNicol G, Bulmer C, D'Amore DV, Sanborn P, Saunders S, Giesbrecht I, Gonzalez-Arriola S, Bidlack AL, Butman D, Buma B. Large, climate-sensitive soil carbon stocks mapped with pedology-informed machine learning in the North Pacific coastal temperate rainforest. Environmental Research Letters. In press. One of the truly big tasks was unifying the regional dataset, and perhaps the most work. Above is the extent of the NPCTR displaying the distribution of soil profile descriptions (light green circles) and the study extent (dark green pixels) used in the SOC stock assessment. Inset maps show global (small) and continental (large) extent of the full NPCTR along with the boundaries of climatic sub-regions. Soil organic carbon stock predictions to 1 m (Mg C ha-1) at 90.5 m resolution for small NPCTR watersheds across BC and SE Alaska. As an addendum to the previous post, an assessment of global wilderness came out today as a comment in Nature: https://www.nature.com/articles/d41586-018-07183-6 . Authored by Watson et al., the assessment concludes that (at a 1km resolution w/ a minimum patch size of 10,000 km2) 77% of the earths surface is impacted by humans. The authors specifically call out carbon valuation as a way to potentially justify saving the remaining few areas to skeptics. The coast of Alaska is one example of some remaining wilderness, or recovering wilderness (in the logged regions). It’s immense carbon stocks are but one aspect of it’s value - perhaps not even the most important part, the wildness which is less substantial but more significant. With the help of USFS FIA technicians, the carbon map of southeast Alaska is completed. It’s the first spatially explicit, high resolution (30m) map of C stocks in the region (an area the size of Florida!) that contains carbon equivalent to 5-8% of the lower 48 forests combined. This mapping also included the major disturbance regimes of the region - wind and landslides - via a new method of mapping exposure. Thus this is far more accurate of “fundamental” or “baseline” C stocks than a map which either ignores disturbances or only uses the most recent events in its calculations - it’s more a map of the inherent C in this ecosystem; recent disturbance events would be layered on top. Turns out that higher disturbance exposure in these areas is correlated with higher biomass C stocks - it’s so infrequently disturbed that it appears disturbances are necessary to maintain biomass productivity. Without them, paludification and muskeg formation take over - lots of C in those too, it’s just belowground in thick organic soils. The manuscript is currently in review. Modeled biomass C (left), and modeled C when various disturbance processes are removed. Generally we see a reduction in C at broad scales without disturbances (especially landslides) but the effect is variable at fine scales. A new publication, led by Andreas Sommerfeld, is coming out in Nature Communications. In this paper, we looked at 50 forested areas worldwide via high resolution satellite imagery to see what their rates of disturbance were, what the main causes were, and if how those disturbance processes changed as a function of climate. It’s truly a unique look at what drives forest change (fires, wind, landslides, etc), where, and when - and how it might respond to climate change. Sommerfeld A, Senf C, Buma B, D’Amato AW, Despres T, Diaz-Hormazabal, Fraver S, Frelich LE, Gutierrez AG, Hart SJ, Harvey BJ, He HS, Hlasny T, Holz A, Kitzberger T, Kulakowski D, Lindenmeyer D, Mori AS, Muller J, Paritsis J, Perry GLW, Stephens S, Svoboda M, Tuner MG, Veblen TT, Seidl R. Patterns and drivers of recent disturbances across the temperate forest biome. Nature Communications. In press. 50 total landscapes, from southeast Alaska to New Zealand.